8th day of the 12th lunar month of 1780 : his father Arashi Kichisaburô I died. 1st lunar month of 1784 : he took the name of Arashi Kichisaburô II. 2nd lunar month of 1788: premiere at the Ônishi no Shibai of the drama "Gishinden Yomikiri Kôshaku"; Kichisaburô played the roles of Momonoi Wakasanosuke and Kisanta (in reality Yazama Jûtarô) [more details]. It was supposed to be staged first in Kyôto at the beginning of the month at the Nishi no Shibai but the theater was destroyed by fire the 29th day of the 1st lunar month. The troupe went to Ôsaka to perform at the Ônishi no Shibai and to celebrate the shûmei of Kataoka Nizaemon VII. 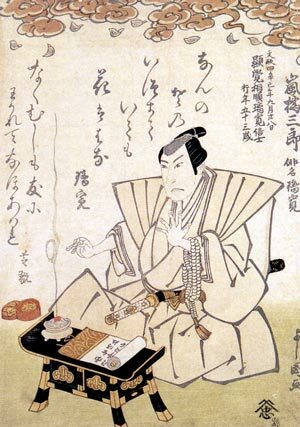 Fall 1789: Kichisaburô achieved a great success in Kyôto at Hayagumo Chôdayû's theater by playing the role of Umeômaru in the jidaimono "Sugawara Denju Tenarai Kagami". 7th lunar month of 1791: Kichisaburô played the role of Issun Tokubê in the drama "Natsu Matsuri Naniwa Kagami", which was produced by Kameya Kumenojô and staged in its full length (nine acts) at the Kitagawa no Shibai; his stage partners were Kataoka Nizaemon VII (Danshichi Kurobê) and Nakamura Tôzô I (Tsuribune Sabu, Mikawaya Giheiji). 1st lunar month of 1793: premiere at the Naka no Shibai of the ni-no-kawari drama "Keisei Yanagi Zakura", the first yanagisawa-sôdômono in Kabuki history, written by Tatsuoka Mansaku and Chikamatsu Tokusô; Kichisaburô played the roles of Masaki Chikara and the yakko Nunohei [more details]. 9th lunar month of 1794: first Kabuki adaptation of Chikamatsu Hanji's puppet theater drama "Kamakura Sandaiki"; Kichisaburô played the role of Miuranosuke [casting]. 3rd lunar month of 1795: Chikamatsu Monzaemon's drama "Komochi Yamanba", which was originally written for the puppet theater, was adapted for Kabuki for the first time, in Ôsaka at the Kado no Shibai; Kichisaburô played the role of Aradômaru [casting]. 12th lunar month of 1796: Kichisaburô played the role of the sumô wrestler Nuregami Chôgorô in the drama "Futatsu Chôchô Kuruwa Nikki", which is produced by Fujikawa Hachizô III at the Kado no Shibai; his stage partner in the role of the rival sumô wrestler Hanaregoma Chôkichi was Arashi Hinasuke II. The same play was performed with the same casting in the 4th lunar month of 1797 in Kyôto at the Kitagawa no Shibai. 11th lunar month of 1799: Kichisaburô performed in the kaomise drama "Yunzei Tôri Yaguruma", which was produced by Fujikawa Katsujirô in Ôsaka at the Kado no Shibai. He also played the role of Sakon Tarô in the drama "Ashiya Dôman Ôuchi Kagami"; his stage partners were Asao Tamejûrô I, Nakamura Noshio II, Nakayama Ittoku I and Seki Sanjûrô I. The troupe moved in the 12th lunar month from the Kado no Shibai to the Kitagawa no Shibai in Kyôto to perform almost the same program. 1st lunar month of 1800: Kichisaburô performed at the Kado no Shibai in the new year drama "Keisei Hana no Yamazaki". 9th lunar month of 1800: Kichisaburô played in the same theater in the dramas "Hade Kurabe Kuruwa Nikki" and "Futatsu Chôchô Kuruwa Nikki". 10th lunar month of 1800: Kichisaburô performed in the same theater in the drama "Hime Kurabe Futaba Ezôji". 4th lunar month of 1801: Kichisaburô performed at the Kitagawa no Shibai in Kyôto in the drama "Ehon Chûshingura". 8th lunar month of 1801: Kichisaburô played at the Naka no Shibai the roles of Mukai Kinzaemon and Kishida Rokusuke in the drama "Yamato Kotoba Suikoden", which was produced by Yamashita Tokujirô; the role of the smuggler Kezori was played by Asao Tamejûrô I. 10th lunar month of 1801: Kichisaburô played in the same theater the roles of Sasaki Tan'emon, Honda Dainaiki and Matsuno Kinsuke in the drama "Igagoe Norikake Gappa". 11th lunar month of 1801: Kichisaburô performed in the kaomise drama "Ôtô no Miya Asahi no Kachidoki", which was produced by Ôtani Torazô at the Naka no Shibai. 12th lunar month of 1801: Kichisaburô played in the same theater the role of Karigane Bunshichi in the drama "Otokodate Itsutsu Karigane"; his stage partners were Ôtani Tomoemon II (Kaminari Shôkurô), Asao Okujirô I (Hotei Ichiemon) and Mimasu Daigorô III (An no Heibei). 6th lunar month of 1802: Kichisaburô played at the Kita-Horie Ichi-no-Gawa Shibai in Ôsaka the roles of Yuranosuke, Fuwa Kazuemon and Amagawaya Gihei in the drama "Ehon Chûshingura"; the roles of En'ya Hangan and Okaru were played by Arashi Izaburô I and Arashi Kichisaburô II and Kanô Minshi I. Summer 1802: the play "Ehon Taikôki" was staged for the first time in Kyôto, produced by Arashi Sankichi at the Kitagawa no Shibai; Kichisaburô played the role of Mashiba Hisayoshi [casting]. 11th lunar month of 1803: Kichisaburô performed in the kaomise drama "Hatsu Yagura Kogane no Manmaku", which was produced by Nakamura Noshio III at the Kado no Shibai. The troupe moved to the Kita no Shinchi Shibai in the 12th lunar month to perform the same program for 10 days. 1st lunar month of 1804: Kichisaburô played at the Kado no Shibai the role of Tsukushi no Gonroku in the drama "Keisei Hako Denju". 3rd lunar month of 1804: Kichisaburô played at the Kado no Shibai the role of the farmer Nosaku in the drama "Katakiuchi Tanba no Uwasa". 4th lunar month of 1805: Kichisaburô played the roles of Sasaki Moritsuna and Miuranosuke in the drama "Ômi Genji Senjin Yakata", which was produced by Arashi Torasaburô in Ôsaka at the Kado no Shibai; his stage partners were Fujikawa Hachizô III (Wada no Hyôe Hidemori), Kanô Minshi I (Kagaribi), Mimasu Tokujirô I (Mimyô) and Morita Kan'ya IX (Hôjô Tokimasa). The same play was performed with the same casting in the 5th lunar month in Kyôto at the Kitagawa no Shibai. 1st lunar month of 1806: Kichisaburô played in the same theater the role of Kanpei in the drama "Iroha Uta Homare no Meiboku". 4th ~ 6th lunar months of 1806: tour in Nagoya for a troupe led by Kichisaburô, Yoshizawa Iroha I, Arashi Sangorô III, Sawamura Tanosuke II and Nakayama Bungorô I; they performed at the Tachibana no Shibai in dramas like "Keisei Sakura no Shima", "Gion Sairei Shinkôki", "Hirakana Seisuiki", "Sarumawashi Kadode no Hitofushi" or "Komochi Yamanba". 8th lunar month of 1806: Kichisaburô played the role of Sasaki Moritsuna in the drama "Ômi Genji Senjin Yakata", which was produced by Asao Tamesaburô in Ôsaka at the Kita-Horie Ichi-no-Gawa Shibai. 1st lunar month of 1807: Kichisaburô played the role of Yoshikawa Saemon in the drama "Keisei Hanabusa Zôshi", which was produced by Asao Okujirô II at the Naka no Shibai. 3rd lunar month of 1807: Kichisaburô played the roles of Kamatari, Shibaroku and Soga no Iruka in the drama "Onna Teikin Yamato Kotoba" (script similar to "Imoseyama Onna Teikin"), which was staged in the same theater. 1st lunar month of 1808: Kichisaburô played the role of Rokuji Namuemon in the drama "Keisei Inazuma Zôshi", which was staged at the Kado no Shibai. 7th lunar month of 1808: premiere at the Kita-Horie Ichi-no-Gawa Shibai of the drama "Kuni Namari Futaba no Oizuru"; Kichisaburô played the role of Awa no Jûrobê [casting]. 11th lunar month of 1808: Kichisaburô played the role of the warrior Tametomo in the play kaomise drama "Shima Meguri Tsuki no Yumihari", which was staged at the Naka no Shibai. 1st lunar month of 1809: Kichisaburô played in the same theater the roles of Odaki Jinnai and Aoyagi Danjô in the drama "Keisei Itako Bushi". 8th lunar month of 1809: Kichisaburô played the role of the sumô wrestler Iwakawa Jirokichi in the drama "Sekitori Senryô Nobori", which was staged at the Ônishi no Shibai. 11th lunar month of 1809: Kichisaburô played at the Kado no Shibai the role of Ueda Keijirô in the kaomise drama "Keishoku Yuki-miru Yama", which was produced by Mimasu Kumesaburô and starred Nakayama Hyakka, Yoshizawa Ayame V, Asao Kuzaemon I, Nakayama Shinkurô III, Nakamura Daikichi I, Kanô Minshi I and Asao Okuyama III. 1st lunar month of 1810: premiere at the Kado no Shibai of Chikamatsu Tokuzô and Namiki Miyosuke ni-no-kawari drama "Keisei Sato no Funauta"; Kichisaburô played the roles of Tadotsu Ikkaku and Hashitomi Ryôsuke [casting]. 4th ~ 5th lunar months of 1810: tour in Nagoya with Nakamura Daikichi I; Kichisaburô performed in the dramas "Ômi Genji Senjin Yakata", "Irogawase Kuruwa Ôrai" and "Sekitori Senryô Nobori", which were staged in the precincts of the Inari Sannô Shrine. 1st lunar month of 1811: Kichisaburô played at the Naka no Shibai the role of Gofukuya Jûbê (Jûbê the dry goods dealer) and Sasaki Tan'emon in the drama "Keisei Ekiro no Ume", with plot and characters belonging to the "Igagoe" world. 4th lunar month of 1811: Kichisaburô played the role of the sumô wrestler Iwakawa Jirokichi in the drama "Sekitori Senryô Nobori", which was staged at the Kado no Shibai; his stage partner in the role of the rival sumô wrestler Tetsugadake was Asao Kuzaemon I. 7th lunar month of 1811: Kichisaburô played in the same theater the role of Kamei Tarô in the drama "Yûzû Dainenbutsu". 9th lunar month of 1811: Kichisaburô played in the same theater the role of Iida Tamon-no-Kami in the drama "Iroha Gura Mitsugumi Sakazuki". 10th lunar month of 1811: Kichisaburô played the role of Sasaki Moritsuna in the drama "Ômi Genji Senjin Yakata", which is staged in Ôsaka at the Kita-Shinchi no Shibai; his stage partner in the role of Wada no Hyôe Hidemori was Ôtani Tomoemon II. The same play was performed with the same casting in the 11th lunar month in Kyôto at the Minamigawa no Shibai. 5th lunar month of 1812: Kichisaburô played the role of Yukihira in the drama "Yamato Uta Tsukimi no Matsu", which was staged in Ôsaka at the Kado no Shibai; his stage partner in the role of Yukihira's lover Matsukaze was Kanô Minshi I. 1st lunar month of 1813: Kichisaburô played in the same theater the role of Enshûya Iheiji in the drama "Ane Imôto Date no Ôkido". 4th lunar month of 1813: Kichisaburô played in the same theater the role of Funakoshi Jûemon in the drama "Yaegasumi Naniwa no Hamaogi". He also played the role of Ono no Tôfû in "Ono no Tôfû Aoyagi Suzuri". 1st lunar month of 1814: Kichisaburô played the roles of Miyagi Asojirô and Okitsu no Nisa in the drama "Keisei Tsukushi no Tsumagoto", which was staged in Ôsaka at the Kado no Shibai. This was the first performance in Kabuki history of a play based on the "Asagao Nikki" world [casting]. 4th lunar month of 1814: "Keisei Tsukushi no Tsumagoto" was staged with the same casting in Kyôto at the Minamigawa no Shibai. 8th lunar month of 1814: Kichisaburô played in the same theater the roles of Kaiya Zenkichi and the monkey trainer Yojirô in the dramas "Kamikakete Chikai no Tsumagushi" and "Sarumawashi Kadode no Hitofushi". He also played the roles of Mashiba Hisayoshi and Oda Harudaka in the play "Hira-ga-Dake Yukimi no Jindate". 11th lunar month of 1814: Kichisaburô moved to Kyôto to participate in the Kitagawa no Shibai kaomise program. He played the roles of Sasaki Tan'emon and Matsuno Kinsuke in the drama "Tsugi Awase Ekiro no Ume", with plot and characters belonging to the "Igagoe" world. 1st lunar month of 1815: Kichisaburô performed in the drama "Akiba Gongen Kaisen Banashi", which was staged at the Naka no Shibai. 5th lunar month of 1815: tour in Nagoya with Arashi Izaburô I and Matsushima Gizaemon; Kichisaburô performed in the dramas "Ono no Tôfû Aoyagi Suzuri" and "Daikyôji Mukashi Goyomi", which were staged within the temple Seijuin. 9th lunar month of 1815: Kichisaburô played the role of Kowari Dennai in the drama "Katakiuchi Ura no Asagiri", which was staged at the Naka no Shibai. 2nd lunar month of 1816: Kichisaburô played at the Naka no Shibai the roles of Akizuki Daizen and the yakko Tsumahei in the drama "Sono no Yuki Koi no Kumidai", with plot and characters belonging to the "Shin Usuyuki Monogatari" world. 8th lunar month of 1816: Kichisaburô played in the same theater the role of Aburaya Yohei in the drama "Aburauri Kuruwa Monogatari". 9th lunar month of 1816: Kichisaburô played in the same theater the role of Sasahara Hayato in the drama "Koi Momiji Ogura Shikishi". 11th lunar month of 1816: Kichisaburô played in the same theater the role of Musashibô Benkei in the drama "Gosho Zakura Horikawa no Youchi". 1st lunar month of 1817: Kichisaburô moved to the Kado no Shibai and played the role of Sutewakamaru in the drama "Keisei Chikugo-ga-Fuchi". 7th lunar month of 1817: Kichisaburô performed in the play "Meisaku Kiri no Akebono", which was staged at the Naka no Shibai. He also plays the role of Sasaki Moritsuna in the drama "Senjin Fujito no Homare". 11th lunar month of 1817: Kichisaburô played in the same theater the role of Tamaya Shinbê in the drama "Echizen Mikuni Fûfuzuka" [print]; his stage partner in the role of Demura Shinbê was Ichikawa Ebijûrô I. 2nd lunar month of 1818: the Naka no Shibai was destroyed by a fire. 5th lunar month of 1818: Kichisaburô plays 2 roles in the drama "Ôgiya Kumagai", which was staged at the Horie no Shibai. 8th lunar month of 1818: Kichisaburô was back at the Naka no Shibai, which reopened, and played the roles of Yoshitoki and Akushichibyôe Kagekiyo in the drama "Musume Kagekiyo Yashima Nikki", which was produced at the Naka no Shibai par Asao Tokusaburô. His stage partners were Arashi Koroku IV (Oito) and Asao Kuzaemon I (Mataroku, Sajidayû). 11th lunar month of 1818: Kichisaburô played in the same theater the roles of Masaemon and Jûbê in the drama "Igagoe Dôchû Sugoroku"; the roles of Oyone and Heisaku were played by Arashi Koroku IV and Asao Kuzaemon I. 1st lunar month of 1819: Kichisaburô played at the Naka no Shibai three roles in the drama "Keisei Miyako Meguri". 9th lunar month of 1819: Kichisaburô played at the Naka no Shibai the role of the larger-than-life thief Nippon Daemon in the drama "Tôtômigata Koi no Shiranami". 3rd lunar month of 1820: tour in Ise; Kichisaburô played the role of Sasaki Moritsuna in the drama "Ômi Genji Senjin Yakata", which was staged at the Furuichi no Shibai. 1st lunar month of 1821: Arashi Kichisaburô II took the name of Arashi Kitsusaburô I at the Naka no Shibai, playing 2 roles in the drama "Keisei Sato no Shimadai", which was produced by the zamoto Asao Yosaburô. His stage partners were the Edo stars Matsumoto Kôshirô V and Iwai hanshirô V. His nephew Arashi Daizaburô III took the name of Arashi Kichisaburô III. 26th day of the 9th lunar month of 1821 : Kitsusaburô died. Arashi Kitsusaburô I was an outstanding tachiyaku, endowed with a great body and a powerful voice, who achieved a great success in the Kamigata theaters, rivaling in popularity with stars like Nakamura Utaemon III or Onoe Kikugorô III. Jitsugotoshi, wagotoshi and nimaime roles were his forte. His best roles: Sasaki Moritsuna ("Ômi Genji Senjin Yakata"), Minamoto no Yorimasa, Miyagi Asojirô, Sasaki Tan'emon ("Igagoe"), Yojirô ("Sarumawashi Kadode no Hitofushi"), Benkei, sumô wrestlers (Nuregami Chôgorô in "Futatsu Chôchô Kuruwa Nikki" or Iwakawa Jirokichi in "Sekitori Senryô Nobori"), Jûbê ("Igagoe") and Ono no Tôfû. Was his first name Arashi Kichimatsu? Or only Hikosaburô? He was recorded as Arashi Kichimatsu in Nojima Jusaburô's book "Kabuki Jinmei Jiten" or the Ritsumeikan University Actors Database. He was not Arashi Kichimatsu but Hikosaburô (only the first name; no family name) according to the latest edition (2012) of "Kabuki Haiyû Meiseki Benran". The 26th day of the 9th lunar month of the 4th year of the Bunsei era was the 21st of October 1821 in the western calendar.